In July, I was lucky enough to meet with a group of men and women at Nicolson Court in Tideswell, in a group run by The Farming Life Centre. Whilst we embroidered the Stitching the Wars quilt, I gathered more wonderful reminiscence, the following are my notes from Marjorie. I’ll be 94 in September. 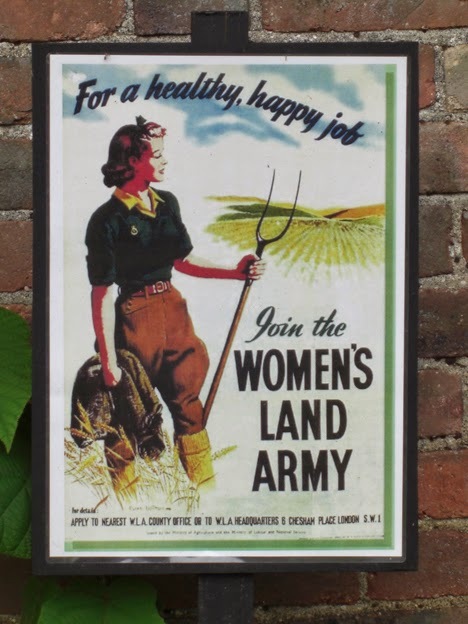 In the Land Army, I based at Lakenheath in Suffolk with 120 other girls, all volunteers. From Sheffield, I was married- my husband a German Prisoner of War. I thought there was no chance of seeing him till the end of the war, so I rented my house up and joined up. It was a spur of the moment thing. I worked in the Steel Office, a girl I was working with said “I’m off to join the Land Army”. I said, ‘ So will I!’ a spur of the moment thing. At Lankenheath we were billeted at the YMCA hostel, 120 of us. Taken by lorry every morning for sugar beet pulling. We didn’t have any training, just give us a round knife and set off to pull it up. It just happened. It hurt to start with, then you got used to it. Ditching, digging ditches- loading sugar beet for the factory- enjoyed it all. When it was haymaking, we’d climb onto the haystack, one day I got to close to the edge and hit the deck- saw stars for 5 minutes. Could have a cooked breakfast at 7.00am, eggs no problem, then on the truck ready for 8.00 and taken to which ever farm you were working at. We had lunch at 12.00, bread and dripping, a tin box with a number on, picked it up on the table in the morning. The hostel was run by the Women’s Christian Organisation. 1.00pm to 5.00pm working again, or if you were a long way from the hostel you might be able to knock off at 4.00. 6.00pm the evening meal, you could take as long as you’d like- but you didn’t take long, as you wanted to get changed, washed and out to the local village. There were temptations for the married lady- but I never took my wedding ring off. We were all in the same boat. We didn’t have much money, all got on together. We had a shared bathroom, you’d be having a bath, someone having a cup of tea sat at the table. There was no privacy at all. I went on a back packing holiday aged 17 in 1937. Just took a haversack, didn’t wear shorts, just a skirt in there. Two of our neighbours belonged to the YMCA, I said ‘I’d love to go’ so saved up my spending money, passport, and plenty of underwear and went by train from Sheffield to London, then away by train to Bavaria. We were in a café having a drink, when Hitler’s voice came over the speaker- everyone stood up, so we did too. The manager came over and thanked us for acknowledging the Fuhrer. The frivolities continued all night.